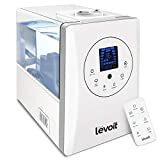 LEVOIT - LV600HH: Humidifier Review • The Air Geeks, reviews of air conditioners, dehumidifiers and air purifiers. Having sleepless nights and repeatedly contracting flu lately? Do you love it when your rooms are smelling your favorite fragrance?. We think it’s time you got a new humidifier from Levoit. They have a perfectly-crafted, modern, and large enough Levoit LV600HH to serve your multiple rooms or the entire house. It will help you keep the flu away from you and your kids and pets so you can enjoy nice air that is free of germs and that has the recommended level of humidity (40-60%) while indoors. Want a premium-quality humidifier that is both cool and warm humidifier that is large enough to serve large rooms? You might want to try Levoit Warm and Cool Ultrasonic Humidifier LV600HH. This humidifier is capable of handling your living room and bedroom or even small houses with its ultra-high mist diffusion rate of about 500ml per hour. This is the ideal humidifier for a large family and can take care of the flu and colds during the cold and dry weather. It also helps reduce static electricity in the house which can lead to shocks that can result in injuries to pets and kids. This humidifier uses ultrasonic technology to ensure the mist emitted is 25% quicker than other humidifiers. Breathing dry air exposes one to a myriad of threats ranging from cracked skins, sore throats, itchy skins to flu and colds. You can opt to choose cold or warm mist to soothe your nasal passage and relieve the severity of the symptoms if you already have them. Properly humidified air is also very crucial for ensuring that your furniture especially one that is made of timber does not shrink or crack due to fluctuating level of moisture in the timber. You can also use it to ensure your musical instruments like guitars remain in good conditions and last longer. Levoit LV600HH is so elegantly designed it also features a remote-controlled digital interface to adjust the speed and the rate of diffusion you desire. The digital display also shows the level of humidity so you can always compare with that of the outside environment and decide on which level is much effective to achieve the desired humidity. The manual controls are touch sensitive proving how much quality this appliance actually is. The humidifier is a smart device so it automatically adjusts the rate of diffusion to ensure a constant level of humidity that does not fluctuate is achieved. Its large capacity tanks can go for as much as 36 hours without refill and has a capacity of 6 liters so you can rest comfortably for more than a day without needing to refill it. Maintenance is very minimal for this device as it is filter-less hence requiring only some occasional cleaning to ensure that it does not emit a foul smell especially if the quality of water is not very great. Another feature that sets this humidifier apart from similar models on the market is that it uses ABS plastic that is leakage-proof to reduce spillage of water, a scenario that is very common with many other models especially when used for a long time. This humidifier can emit both warm and cold mist as per your liking. The warm mist is very refreshing and helps in getting rid of harmful bacteria, mold, and other germ harboring organisms that can cause colds, flu, and itchy skin. Cool mist is useful in lessening the effects of stuffy noses and thus enabling a proper flow of air in the nasal passage. This humidifier is the perfect tool for aromatherapy. Have a favorite fragrance or essential oil you would love on your room? Use it with this humidifier and notice the difference! It has a small drawer where you can put your favorite oil and it will intelligently diffuse it with the vapor to achieve that nice soothing aroma in your house. At less than 36dB noise level, you get to sleep comfortably with this appliance on as it is barely noticeable. Finally, it has an auto-shutoff feature that ensures safety especially when water runs out to avoid fire incidents or burns. It is versatile as it works both as a warm and mist humidifier. It can cover large rooms and entire houses. It is not ideal for use with water that is not purified as it does not have a filter itself. I’ve only owned this for a week but I’m more than satisfied with it. My pet ferret seems to love it as well. Really helps add moisture to the air when needed. My thoughts is one person mentioned it had a strong plastic odor, which is correct but that goes away after an initial rinse and running it for 6-8 hrs straight. Pretty easy to use and I LOVE THE REMOTE. Worked fine and had no trouble turning on or off a good distance away. Was impressed. NOTE TO FUTURE BUYERS: if you go to their website and enter your email they will send you a 15% off coupon to enter in Amazon. I failed to find that out till after I ordered so maybe someone else here can benefit. Even if not wasn’t a bad price and VERY Quiet !" Everything I was looking for in a humidifier! Not only is the humidifier easy to use it works great!! I love the diffuser option and the remote. The only down fall I have found is that the display is bright.."
Levoit LV600HH is a perfect humidifier for large rooms and for those who love a mix of both warm and cold mist experience. Though a bit pricey, it does go the extra mile to prove why it is worth every penny. You can say goodbye to cheaply made humidifiers and embrace a new experience free of flu, sleepless nights and discomforts associated with dry air.